No mountain landscape is more spellbinding for mountain bikers than the Dolomites. We'll conquer the main Alpine ridge on the very first day. This will leave us ample time for the stunning landscapes and riding experiences in the white mountains. Though the ride is technically demanding, it's not too tricky - and the landscapes are magnificent. A tour that's a bit of a challenge for everyone but still leaves us with enough time for breaks and a cappuccino or two. We'll start with the first "pinnacle stage", the crossing of the Alps at the Pfitscherjoch. At first, we'll go steeply uphill on forgotten side streets. The glacier lies within reach. The view at the top makes up for the one kilometer long passage we had to push the bikes. After that, we'll fly down into Pfitscher Tal, directly to the rustic mountain inn with its sauna. Imposing castles line the Eisack Valley. Our bikes roll on ancient cart paths. We'll traverse a narrow crossroads on our way to the Pustertal and then make for Steanfsdorf in the near of Bruneck. Once there, we’ll stay in a nice wellness hotel. The curtains rise on some of the most magnificent mountain scenery in the world. 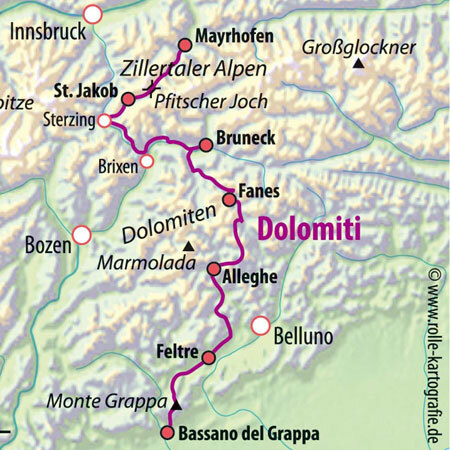 Narrow mountain roads will take us into the heart of the Dolomites. We'll stay overnight in comfortable huts located in the rocky arena of the Fanes-Sennes-Prags Nature Park at over 2000 meters altitude. We'll start on the roof of the world and swing through one of the most beautiful, high-altitude valleys of the Alps. At the legendary Falzarego Pass, the Marmolada mountain is within reach. And this is only the prelude to an unforgettable day. On a steep gravel road, we'll climb the Rifugio Averau past the legendary Cinque Torri group. Then we'll enjoy one of the most spectacular trail descents in the Alps. Often, there's still morning fog lying on the idyllic mountain lake in Alleghe at the foot of the mighty Monte Civetta. A little later, we'll ride secondary roads through sleepy villages and breathtaking canyons in the forgotten Valle del Mis. Just before today's destination of Feltre, we will have arrived in the opulent embrace of Italy. The climb to Monte Grappa is long and varied. Utilizing "dynamite trails", we will reach the summit. After that, we'll almost fly downhill, accompanied by paragliders and hang-gliders. Farewell dinner taken together. After breakfast, the bikes are loaded onto the bus. Return trip by bus back to Mayrhofen. Upon arrival, everyone travels home individually. Felix Lauhoff, ALPS bike guide for the Transalp Dolomiti. Arrival: Arrival by car or by train to Ramsau/Mayrhofen/Austria. Type of route: Gravel paths, secondary roads, trails, short stretches of pushing. Included in the price: Guided tour with 7 overnight stays and half board (breakfast buffet, multi-course dinner menus) in good 3- or 4-star hotels in a double room (including 1 overnight stay in a hut with multi-bed rooms and 1 overnight stay in a mountain inn or guesthouse), often with wellness areas. Luggage transport, lift ticket, return transfer in a comfortable bus. July: 06. /	13. /	20. /	27. /	28.